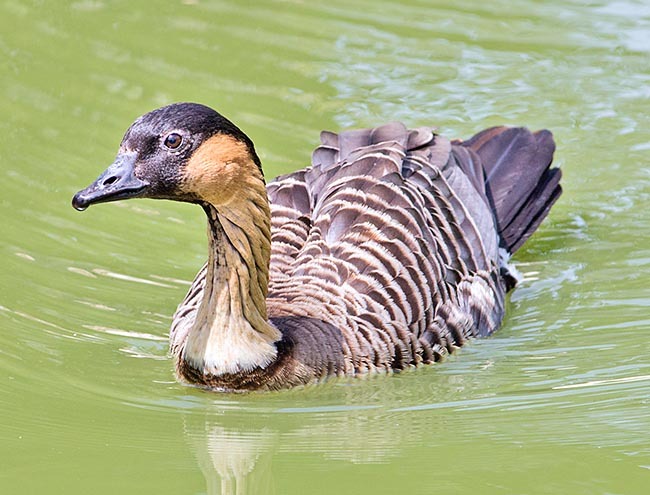 The Nene or Hawaiian goose (Branta sandvicensis Vigors, 1834) belongs to the order of the Anseriforms (Anseriformes), to the family of the Anatids (Anatidae), to the genus Branta and to the species Branta sandvicensis. The name of the genus “branta” probably comes from the word in Old Norse “brandgàs” meaning “burnt goose” with reference to the prevailing colours of the geese belonging to this genus. The name of the species “sandvicensis” comes from “sandwichensis” which, in turn, refers to the name that was given to the present Hawaii islands, that is “Sandwich Islands”, by the British explorer James Cook in 1770. 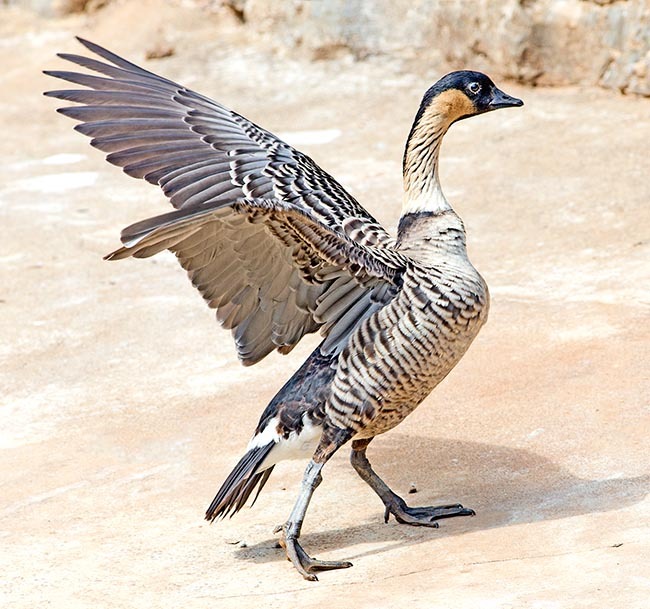 The nene is the biggest bird endemic to the Hawaiian archipelago. The species was, once, known under the term of “goose of the Sandwich Islands”, the old name of their tropical original archipelago. The nene is the species of goose, as such, with the smallest southernmost range in respect to all other extant species of goose. Furthermore, it is the only species of goose living in a confined area on islands. Presently, the species lives on the slopes covered by volcanic rock of the Mauna Kea plateau and on the volcanoes Mauna Loa and Hualalai and in few other sites on the Hawaii Island. The species has been re-introduced up to the plains of the Kauai Island and in the crater Haleakala n Mau Island. It is a sedentary and disinclined to flight species; unique case amongst the geese of “Northern stock”. It lives in the different habitats of the Hawaii archipelago: in sparse bushy thickets, prairies, coastal dunes, expanses and rocky slopes of lava from the sea level up to the 2500 m and more of altitude. Even if the plateaus of the Hawaii Islands are often wrapped by low clouds carrying humidity and favouring the formation of dew, these sites prove to be substantially semi-arid and the only water available is that gathering spontaneously in small temporary puddles. The species has adapted to take advantage also from artificial habitats such as golf courses, meadows and cultivated fields. It is a medium-sized goose with a height of about 40 cm and weight of 1,5-3 kg (the males usually weigh little more than the females). The rostral part of the head (face) and an ample dorsal belt of the neck are black and form a unique drawing with the beak which is black too. The rest of the head, that is, the zone of the cheeks and the lateral and ventral parts of the neck have a typical ochre-yellow, buff-leather colour. The feathers of the neck form, on the same, deep incisions, grooves, and slots, so much that the neck appears ribbed-corrugated in stripes with characteristic dark, slightly undulated lines. The colouration of the neck ends up neatly at the base of the same, at the level of a sort of small collar with dark ring. The rest of the body is of caffè latte-burnt sienna colour with the lateral wings and even more dorsal darker, brown-blackish, ending in paler margins (always of brown-burnt colour). Dark brown blackish are also the remiges of the wings and the rectrices of the tail. The under-tail and a belt of the upper tail are white. The nene goose is known also under the name of “lava goose”; it is the only aquatic bird adapted to live on the unwelcoming, rocky, lava flows. The hostile, rough and uneven terrain of the steep volcanic slopes has shaped and selected the species which has developed long and robust legs, endowed of long fingers only partially webbed rendering these geese more agile than the congener species. The paws, in this species, are placed well forwards in respect to the body allowing a gait different from that typical of the geese, and therefore not wavy. The paws are grey-blackish. Moreover, the feet are well padded of tissue which forms a sort of pad, in way to allow walking easily on the rough and edgy lava. The eyes are fairly big and expressive, of very dark brown-black colour, and confer a likeable-intelligent look to this goose. Their famous name of Polynesian origin “nené” refers and comes from their low, week and mournful vocalizations which resemble moans. 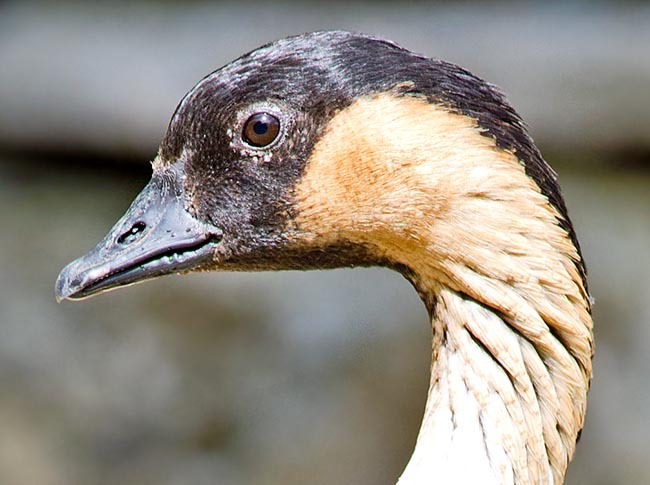 The assumption that the nene is related to and comes from the Canada goose (Branta canadensis) has been confirmed by the genetic analyses. Their “Canadian” ancestors did migrate on the Hawaiian Islands probably 500.000 years ago not long after the “birth” of the islands themselves. They nested in the prairies and in the open forests from the sea level up to the border of the pluvial forests on the islands Hawaii, Maui, Kauai and, probably, Nihau and Molokai. Since, as seen, these gees live in habitats lacking of water, the result being poor swimmers and the matings normally take place on the ground. They have vegetarian-herbivorous diets nourishing of all the parts of the often scarce vegetation they are able to find. Usually the nene geese gather in small groups at bigger altitudes in summer and in lesser ones in winter in harmony with the growth of the vegetation they eat. Also the nene geese, like all Hawaiian birds, have been strongly penalized by the arrival of the mosquitoes, which settled in the archipelago by around the 1900, vectors of the avian malaria. Due to this scourge, half of the 140 avian species endemic to the Hawaii have become extinct; among the surviving ones, half are still now critically endangered and some species have been obliged to shelter over the 500-600 metres of altitude where the presence of the mosquitoes is reduced. In order to appear more aggressive and menacing, the nene goose raises and vibrates the feathers of the neck. This species, contrary to the other goose species, is not influenced by the increasing photoperiod; the reproductive season is prolonged and goes from August to April. In the wild, most of the pairs nidify under bushes of the native heather (Leptecophylla tameiameiae) or under other shrubs growing on the lava flows. Usually, they nest between the 1500 and the 2500 m of altitude. No wild nests have been observed before 1956. The nestling is usually formed by 3-4 (1-5) eggs. The incubation lasts about 29-32 days. The gosling has dark brown upper part (including the vertex of the head and the dorsal neck) and ventral parts greyish-whitish (including the front, the cheeks and, ventrally-laterally, the neck); nuanced dark is the auricular zone and a second spot placed between eye and beak. The down has altogether a hazy look. The beak is already dark (brown-blackish) and the paws are greyish with fleshy hues. The young grow up rather slowly, also due to the scarce alimentary resources and the few hours of light (in respect to the Northern relatives) available, needing up to three months to reach the age of the flying off and may remain with the parents up to the following reproductive season. Also in ideal conditions, in the wild, the young’ survival rates are fairly low. The nene goose has been close to extinction: it is thought that before the arrival of the Europeans in the Hawai (1778) the population was of about 25000 individuals. The natives had been hunting, for centuries, the species but only during the time of the moulting, when the geese did lose the ability to fly and were coming down the valley zones, not affecting, in this way, so much the global population. The huge venatorial pressure done by the Europeans and the Americans has been the primary cause of the extremely serious decline of the species; large loads of nene were utilized as food on the whalers and for feeding the Forty-Niners emigrants in California. Another catastrophe, for the species, has been the introduction of the Indian mongoose (family Herpestidae) in 1883, which was supposed to fight the rats in turn introduced on the archipelago. As often is the case, alien species introduced for theoretically control some species, possibly non-native in their turn, cause on the contrary true damages to other species possibly autochthonous and rare!!. The Indian mongoose, in fact, began to manly predate eggs, chicks and hatching females of nene goose. Finally, cats, dogs, oxen, horses, pigs, sheep and goats, arrived along with the strangers, did further worsen the situation also for the degrading impact they had on the natural native habitats of the archipelago. When, at last, in 1907, they decided to protect this species, the geese had disappeared on all the islands of the archipelago but on Hawaii. In 1949 the nene goose has risked to disappear definitively from our planet; in the wild remained 20-30 specimens and in captivity only 17. Two geese coming from a breeder of Hilo, who in 1940 had a small group of this species, plus a specimen coming from the Honolulu zoo and a wild female did form the first exiguous group of a programme of reproduction in captivity started rightly in 1949 at the Hawaiian Pohakuloa Forests and Fauna Centre located on the slopes of Mauna Loa. The next year, three specimens were sent in England to the newborn Wildfowl Trust; here hundreds of specimens were bred successfully removing the species from the brink of extinction. There is no doubt that the artificial breeding and the diffusion in captivity have been fundamental for the recovery of this species. Thanks to the love of the breeders, before scientific and then amateurish, the species is very diffused and bred in captivity all over the world. 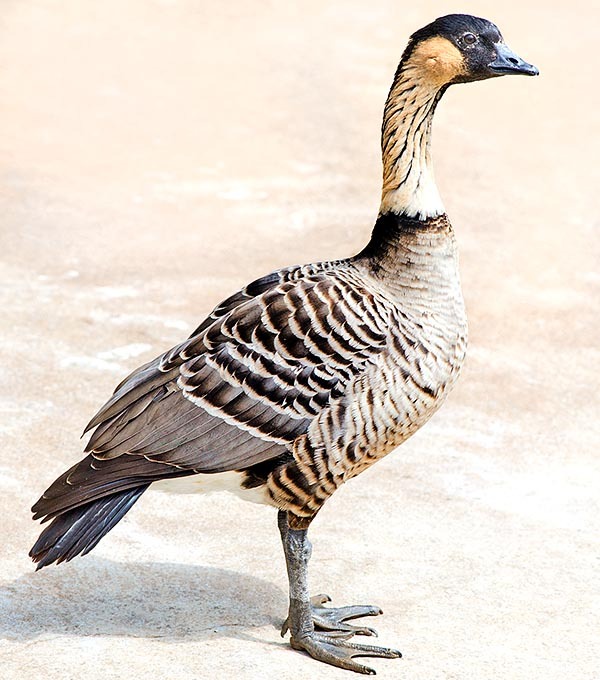 In the wild, the nene goose has been reintroduced many times starting from 1960 and more than 2000 specimens have been freed in 8 locations deemed suitable on the islands Hawaii, Maui and Kauai. The reintroduction plan has not met the hoped success especially because the birds were not capable to support themselves on the feeding point of view. Only in three of the eight sites the reintroduced population has become stable or has increased. The difficulties for an effective repopulation in the natural territories are multiple: predation by introduced carnivorous animals, the incapacity of the bred animals of getting used to the hard conditions of the wild habitat, the poor conditions of the foraging and grazing territories, the massive loss of newborns for dehydration and hunger due to poor quality habitat, the urban circulation causing many accidents (on Hawaii and Maui), the poaching (hunting is presently forbidden). In the wild, the population keeps under the 1000 specimens and with all the modern problems with which, as we have seen, the species must fight, this result is already almost incredible. Luckily, as we said, thousands of specimens are maintained and easily reproduced in captivity. The nene goose, in captivity, is particularly agreeable and sympathetic even if maintaining typical “goose” aggressive and defensive attitudes.